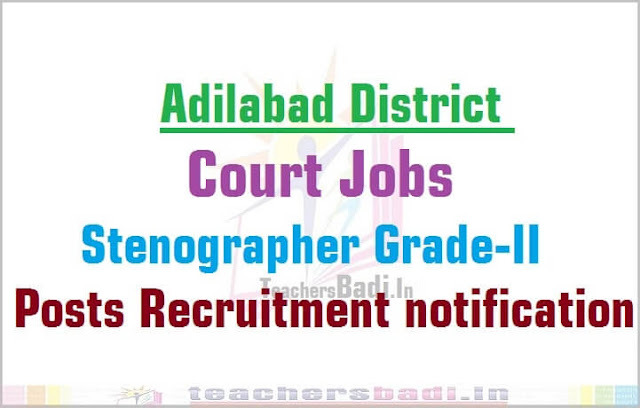 #Adilabad District Court Jobs 2016| Various Posts 2017 @Adilabad Court - Recruitment for the Post of Copyist,Field Assistants,Typists 2017 @ Adilabad District Court: Adilabad District Court Jobs, Office of the Principal District Judge, Adilabad has given the Copyist,Field Assistants,Typists posts Recruitment 2017 notification and applications are invited for appointment to the following posts by direct recruitment in the Unit of the District Judge under A.P.L.G.S. Rules. Age Limit: Must have completed the age of 18 years and must not have completed 34 years of age as on 01.07.2017. Copyist: Intermediate. English Type writing by Higher Grade. Adequate knowledge of local languages i.e., Telugu, Urdu or Marathi. Field Assistant: Intermediate. Adequate knowledge of local languages i.e., Telugu, Urdu or Marathi. Typist: Intermediate. English Type writing by Higher Grade. Adequate knowledge of local languages i.e., Telugu, Urdu or Marathi. How to Apply: Applications shall be addressed to the Prl. District and Sessions Judge, Adilabad. The applications shall be sent by Registered post/ Courier service only. Applications are invited for appointment to the posts of Examiners by Direct Recruitment under A.P. Judicial Ministerial Service Rules in the unit of District and Sessions Judge, Adilabad. Age Limit (as on 01.07.2016): 18 - 34 years. Qualification: Intermediate. Candidates must have adequate knowledge of local languages i.e., Telugu, Urdu and Marathi. Last date for receipt of applications: 09.11.2016. Applications are invited for appointment to the posts of Junior Assistants by Direct Recruitment under A.P. Judicial Ministerial Service Rules in the unit of District and Sessions Judge, Adilabad. Intermediate. Must have knowledge or qualification in computer operation. Must have adequate knowledge of local languages i.e., Telugu, Urdu and Marathi. Age Limit: Must have completed the age of 18 years and must not have completed 34 years of age as on 01.07.2016. Method of recruitment: Based on written test (Objective Type) and viva voce. Last date for receipt of applications is: 31.10.2016. Applications are invited for appointment to the posts of Typist by Direct Recruitment under A.P. Judicial Ministerial Service Rules in the unit of District and Sessions Judge, Adilabad. Qualification: Intermediate. Must have knowledge or qualification in computer operation. English Type writing by Higher Grade. Method of recruitment: Based on Written test (Objective Type), Skill test (Typing test) and viva voce. How to Apply: Applications shall be addressed to the Prl. District and Sessions Judge, Adilabad. The applications shall be sent by Registered post or Courier service only. Recruitment for the Post of Stenographer Grade-II @ Adilabad Dsitrict Court: Adilabad District Court Jobs, Office of the Principal District Judge, Adilabad has given the Stenographer Grade-II posts Recruitment 2016 notification and applications are invited for appointment to the following posts by direct recruitment in the Unit of the District Judge under A.P.L.G.S. Rules. Age limit: The candidate must have completed the age of 18 years and must not have completed the age of 34 years as on 01.07.2016. Qualification: Candidate must have passed Intermediate Examination conducted by A.P., State Board of Intermediate Education or any equivalent Examination. Must have knowledge or qualification in Computer Operation. Technical Qualifications: English Typewriting by Higher Grade. English Short Hand by Higher Grade. The application shall be in the prescribed proforma and to be sent by Post/ Registered Post/ Courier. Applications shall be addressed to: The Prl. District & Sessions Judge, Adilabad.